When Marguerite's father is murdered, all the evidence points to one person - Paul, her parents' enigmatic star student. Before the law can touch him, Paul escapes into another dimension, having committed what seems like the perfect crime. But he didn't count on Marguerite. She doesn't know if she can kill a man, but she's going to find out. With the help of another physics student, Theo, Marguerite chases Paul through various dimensions. In each new world Marguerite leaps to, she meets another version of Paul that has her doubting his guilt and questioning her heart. Is she doomed to repeat the same betrayal? As Marguerite races through these wildly different lives - a grand duchess in a Tsarist Russia, a club-hopping orphan in a futuristic London, a refugee from worldwide flooding on a station in the heart of the ocean - she is swept into an epic love affair as dangerous as it is irresistible. I thought this would be an updated version of Sliders from Sci-fi. Instead it's a book that too hard tries to make the tension from a love triangle last as long as possible. 80% of this book is introspective thought, usually about a boy, then the narrator, then family. Parts are painful to get through. This girl accepts on faith a mission to kill the man she is in love with, doesn't understand half of the ideas involved, and doesn't really even direct her own narrative until the very end. In fact, I think she has two scenes of significance where she makes her own decisions and isn't being escorted by a lover (both times waiting for rescue). Ok, three (London, Russia, Waterworld). Rescued every time. So if you want to feed some inner dialogue to the home-made robot girl you're tinkering with in the basement, this motherload is all the drama you'll need. Kudos to the illustrator and voice actor. The russian and french accents are cringeworthy, but maybe they are in real life, too. What made the experience of listening to A Thousand Pieces of You the most enjoyable? I used to love the show Sliders. Experiencing every possible new earth that could've been. Claudia Gray also gives a sort of Cloud Atlas some souls are meant to be together type of thing. Has some great twists. That's refreshing when it seems like so many books have become mind-numbingly predictable. While I would have preferred no hint another teen love triangle, this one doesn't seem so bad. But maybe I'm the only one who doesn't get a thrill from dangling two guys at once. It's so popular in YA, but I don't get it. Ok, I put my soapbox away. I gave it 5-stars all-around because it is well-written and so much FUN. Some really gorgeous sentences here. Glad to see this in YA! This my first experience of Gray's work and I can't wait to try her others. What other book might you compare A Thousand Pieces of You to and why? Timebound by Rysa Walker - similar rhythm but time travel. Full of heroic romance. Every Day by David Levithan - Equally awesome. This person jumps into a different body everyday. It's thoughtful. No love triangle. The Blood Vivicanti by Becket - Blood memories give Mary Paige the abilities of her victims, who don't die and experience euphoria when bitten. Full of adventure and gadgets. Also, no love triangle. Her accents are spot on. I'm not sure I would have really heard any accent in my head if I had just read it. I was surprised when she started doing them, even though the author makes it clear that the characters have the accents. Accents make everything more fun. I like her British dad voice. It sounded comical sometimes though. That's not meant as an insult, though I'm not sure how else it could sound. In fact, she is exactly the person I hope to ask to narrate for me, when I'm published someday. Maybe it was just me. Yes, the book and narrator made you want to forget everything around you and just listen. But I listen and read at the same time. That's just what I like. 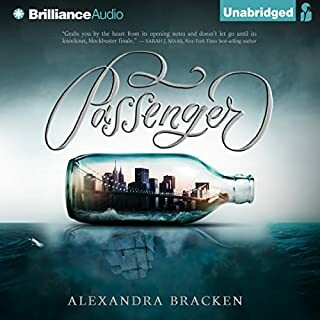 I own a paper copy of the book that I've read by myself and I really enjoyed it, but I have to say that this audible version is Great! The reader is a remarkable performer and adds to the story that something quite unique that made me fell for this book so completely and once again more and really deep. I' m so overwhelmed with emotions right now that I can't wait to listen to the second book in the series. I feel like it had a lot of build but right when it started taking off, it was over. I know this is a series but generally the 1st book really hooks me and I just HAVE to know what happens to the main character... I'll check out the next if I find myself at a loss as to what to read somtime. It was a neat concept though. One of the most interesting, unique stories I have had the privilege to read in quite some time. I can't even begin to capture a picture of the basic story for you, all that would do is serve an injustice. Just trust me, you need to go pick this book up and me as captivated as I am now. I can def see this being made into a major motion picture. Why can't all stories take you on a journey such as this one?! This book had been on my TBR and on my shelves for a very long time (I mean, hello, one of the most gorgeous covers I've ever seen) and the concept was something that instantly drew me in. I finally grabbed the audio for this, wanting to read something more sci-fi and what better to pick up than an multi-dimension story? The book started off abruptly for me. It kind of starts right in the action and things immediately start happening. 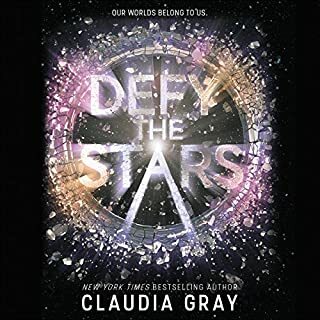 I really wished Claudia Gray had taken the time to set up a little backstory before throwing readers into things because it permanently messed up my feelings towards some of the characters, without giving away any spoilers, and once that happens, it's really hard for me to go back and &quot;correct&quot; that. The first impressions stuck with me and I didn't even have time to learn a little backstory, but more importantly, see some character history and personality, before the action took off. The concept was exactly what I was looking for! Hopping from dimension to dimension and travelling between worlds. I have to say, I was super impressed with the different universes that Claudia Gray created for these characters! Most books, when dealing with alternate universes, focus a lot on things that are very close to the life that we're living now but a few major or minor things have been changed to have a significant impact on a character. Here, Gray set up worlds where the main characters have a whole lot more to figure out. From a world where technology has progressed much faster to a world where technology has progressed MUCH slower so that the world is essentially still in the dark ages. A world where Marguerite ends up in a place almost exactly like her home to a world where she lives in a different country and has an entirely different upbringing. It's easy to create a setting for a book a tamper with it slightly to come up with an alternate universe. Claudia Gray really gets into the different possibilities and how anything minor can create a huge major difference! I also really love the family aspect and how tightly knit this family is. There's a great dynamic, the parents are loving and supportive (although I guess it depends in what universe, right? ), and the graduate students that work with Marguerite's parents have become a part of the family too. What I didn't love was the romance. It was set up a little awkwardly and there were some... things that happened that really turned me around right from the start. I won't get into details because that heads into spoiler-ville but the set-up and execution of the romance felt really clunky to me and even heading straight on to the second book (which I'm reading now), I still can't shake that feel because of how it was set up in book one. Again, with no backstory for these characters when the book started, I had no sense of who was supposed to be what to Marguerite, the history she had with them, her feelings for them, and why she should trust anyone. I just really needed that chapter or so in the beginning to introduce all of the characters. 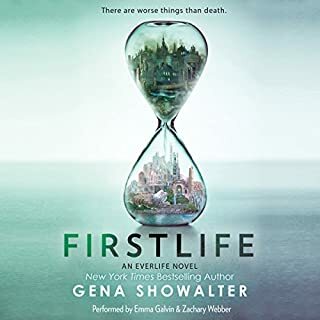 The book felt like it was the second book in the series, not the first, with the way that it started and threw the story and characters at me right away and that made things a little difficult. The book does offer flashbacks so readers are still able to see things from &quot;before&quot; but that didn't really make up for what I was wanting in the very beginning. 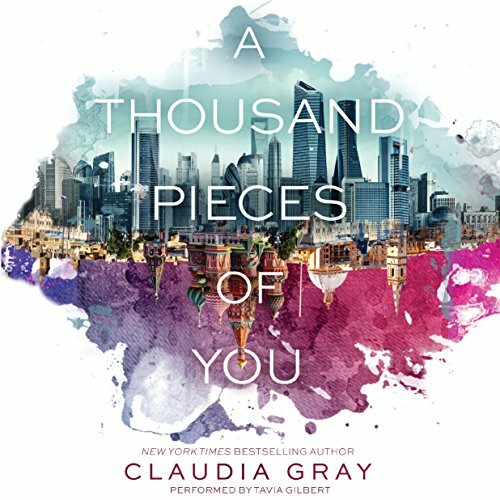 A THOUSAND PIECES OF YOU didn't exactly go how I had hoped but it was still an enjoyable read and I'm so impressed with the different worlds that Claudia Gray has built! I'm already in the second book because I'm interested in bingeing the whole series and I'm loving her creativity so far. Would you listen to A Thousand Pieces of You again? Why? 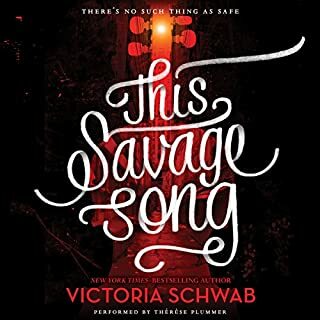 I would listen to it again to search for other details in the story, but mostly because I adore Tavia Gilbert!! My favorite scene was when 'Meg' and Paul spend a night in the cabin in Russia. I really enjoyed all of the scenes in Russia! I would listen to a boring Textbook on paint drying as long as Tavia Gilbert is narrating. I enjoyed the author's idea and the worlds and characters she created. The book may have just been a little too young for me because it was mostly about a teen romance. 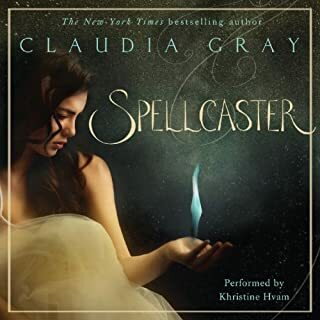 Would you be willing to try another book from Claudia Gray? Why or why not? Probably not. This book was an ok listen, but nothing that thrilled me in to wanted to explore more. Tavia did a good job with all the characters. I love the main character, and the science is fun and relatively easy to understand. very cool and I ended up loving the Russian party the most. Predictable and stereotypical 15 year old romance, including 2 beautiful and handsome men: the mischievous and the mysyerious. A sci-fi background for the story but the author uses age-worn tricks such as student-professor trope to explain how things work. One, we don't need to know exactly how they work for the purpose of the story and two there are far better ways. Also, I don't remember being so gullible when I was 15 . . . a weak female character. I've read far better developed and written young adult fiction. Couldn't finish it it was so boring. One of the most unique stories I have encountered in a long time. Jumps from scene to scene; each as beautiful and intricate as the last. Highly recommend this series. 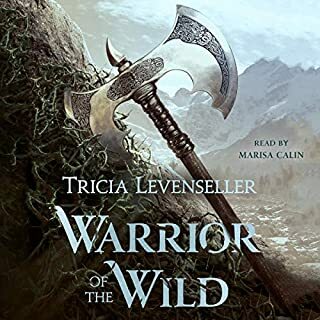 The narrator (Tavia Gilbert) does an astounding job. Different accents and rapid changes of tone are done flawlessly. Have a listen for yourself!